Showing results for tags 'Chogokin'. The previous thread folded to the Hall of Super Topics. http://www.macrossworld.com/mwf/index.php?showtopic=35195 Here's a recap of what's coming in the next few months. April 2012: Super Parts for VF-25F and VF-25S May 2012: YF-29 reissue June 2012: Armored Parts for for VF-25F and VF-25S, plus VF-171EX No word on when the rest of Skull Squadron is coming. I've been meaning to do a quick and dirty review of these guys for a while now and finally had time to take a few photos to go along with it. So without further delay, here's my introduction to the answer to the problem of the (otherwise) wonderful Bandai VF-171 toys. After seeing Macross Frontier, I was smitten by the new VF-171 and actually liked it even more than the VF-25 that was central to the story. Something about the lines, the colors, the shimmery way it often exploded... Sadly, a toy or even a model of this thing seemed to be nothing more than a pipe dream. There were model companies hinting at it (Experten, I believe) but we never saw anything real materialize. And then, out of the blue, Bandai announced the VF-171EX and there seemed to be hope! The "normal" version arrived a bit later but finally, we had a toy! I waited until after the armor parts were released before I jumped on the 171 bandwagon and really had no idea what I was getting myself into. Like most of you who own this toy, I was shocked to find out how terribly made some of the black parts were; like many here, my shoulder pieces had some serious issues. 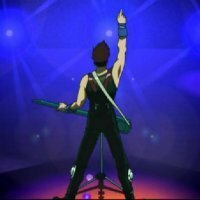 Look no further than this topic: http://www.macrossworld.com/mwf/index.php?showtopic=37652&page=1 for similar stories. Broken shoulders, broken legs, broken internal pieces. This thing has grown into almost legendary status for how unreliable it is. But for most, the shoulders remain the real issue. Until now... Resident Macross World member Xigfrid provided the answer, in the form of a Shapeways produced part. He offers a few variations, which I'll describe in more detail shortly. But suffice to say, for those of you with broken shoulder triangles, there is now a solution! I purchased a few sets from him as a "just in case" measure. But also in the hopes of spreading the word about this little fix and hopefully providing other 171 owners with a means of enjoying their little green (and sometimes white) engineering marvels again. The parts I'll be showing you are the basic versions, printed in one solid color. Two types are offered, a "no triangle" version and a "with lower triangle" type. Click the links for a look at the Shapeways site for more details and to place your order. Xigfrid also offers a pre-printed logo version, where the NUNS logo and stripe are represented by two colors of printed plastic. I didn't opt for these because they were more expensive, the colors weren't "exactly" right, and I wanted to experiment with painting myself. I asked Xigfrid a lot of questions before ordering and this guy is a top bloke. Very helpful, very patient, and very easy to deal with. So, here's a look at what you get: The parts come printed as one "tree" with only the end bits anchored. Both left and right triangles are on the one tree. It's quite an impressive thing to see the inner parts just sort of hanging on the spindle down the middle and understand they were printed like this. The parts I chose were finished in "White, Strong & Flexible, Polished" material (WSFP). They're very strong, but there is some printing edges that are obvious when looking closely at the parts. The surface reminds me of velvet. You'll notice in the image above, there's a slight difference between the left and right parts, with the left side being the "without triangle" and the right one being "with lower triangle" type. The only difference is a notch cut into the bottom of one of the parts, for each side. I'll show why this is important a bit later. Here are some close ups: The parts assembly is very easy, and the only advice is to cut down on the post that attaches the two outer sides together. If you use it as is, the fit is a little too tight. Trimming a few mm off the end is advisable so the post doesn't bottom out in the hole. So, what exactly are we replacing? Here's an old picture I took of the part in question: And a typical shot of the damage one is likely to see when it breaks (if you can remove all the pieces without losing anything): Now, for some irony... I fixed this part with super glue a few years ago. I then promptly put it back in the box in disgust and didn't even look at it until I saw these new Shapeways parts were available. And when I did look, it was purely to figure out if I needed "with or without triangle" type parts. Imagine my surprise when I got the replacement part in, dismantled the part to do a test fit, and discovered the fix was still in place! And to make things even more surprising, the other seemed to be fine, with no signs of stress or breakage. Seems I got very lucky with my sample. Moving on, here's the lower triangle, so you can determine which type of part you should order: The thin, black, hinged in the middle thing in the bottom of the wing root. It's easy to forget about when going from any mode back to fighter and WILL be the thing that prevents you from popping the legs into fighter position, because you forgot to fold it back into position beforehand. Ask me how I know... See those little white lines coming from the pin? That's not hair, those are cracks. Both of mine have this but for now they're still intact. If yours are broken, you may do well to remove them entirely. They're held on by that screw through the teal colored piece, just next to the triangle in the above image. They don't really do much, and honestly, they're annoying. They never sit right, they're always in the way, and even if you do get them perfectly aligned, they look like they weren't designed to be the right shape to fill the gap they're there for. Here's what's behind the part when you swing it out of the way: That notch (notice the repair marks on my example) allows the pivot pin hinge in the triangle to sit up against the top triangle. If you don't have the bottom pivot triangle, don't get the replacement part for the "with triangle" type. It'll have a hole in it and it'll be noticeable. Instead, opt for the standard type. Simple. I haven't fit my parts because I didn't need to, as mentioned. But disassembly is fairly straight forward. You can pry the whole shoulder open and pop the arm out, followed by the triangle. If you're very careful, that is. Otherwise, there's a screw cover that will most likely be glued in, hiding a small screw that keeps the shoulder together. Removing this will allow the shoulder to come apart much easier. One side on mine was easy, the other was glued in so completely that I wasn't able to remove the screw. Your mileage may vary. Prep of the parts is up to the person doing the installation. But note that none of the parts are terribly smooth unless you opt for the much more expensive translucent material. And even then, sanding is recommended. I'd planned to prime, sand, smooth and then paint these things black. The intention for the NUNS lettering was to print a mask or maybe do some decals. Given my part is still OK, that's a decision I'll leave for somewhere down the track. Check out Xigfrid's store. He's got some great stuff on offer: http://www.shapeways.com/shops/xigfrid3dshop If a mod happens by this, mind adding that missing 'w' to the end of my topic title?